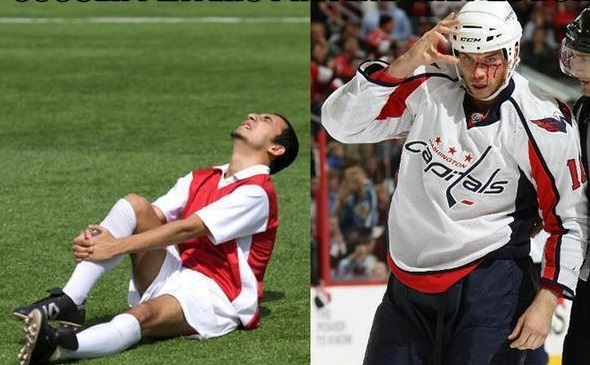 It has been called the Rocket’s most famous goal and it happened before hockey was broadcast on TV. After being crushed by a big hit from a Bruins defender and laying in a pile of blood on the ice, Richard returned in the third when he probably shouldn’t have. With a bandage wrapped around his head, Richard picked up a pass from Emile Bouchard and weaved around all five Bruins players before faking a shot and beating goaltender Jim Henry with a backhand. The photo below became famous, showing Henry and a bloodied Richard shaking hands. 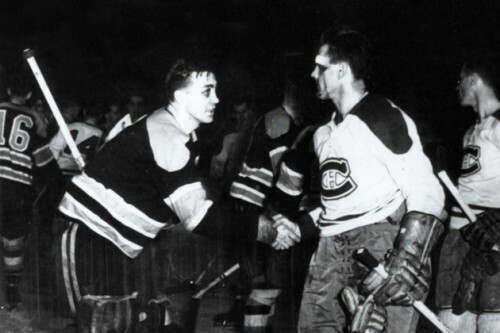 “Sugar” Jim Henry of the Boston Bruins congratulates Maurice Richard of the Montreal Canadiens, following Game Seven of the 1952 Stanely Cup Semi-Final. The Canadiens won the game, and the series, with Richard scoring the winning goal. The Habs would go on to lose in the Stanley Cup final to the Detroit Red Wings; too tired and sore from their massive seven game series against the Bruins. The Boston Bruins entered the 1970-71 playoffs as the easy favourites (just like in 2014) but no one could see the incredible emergence of Montreal’s rookie goalie Ken Dryden. After Boston won the first game and went up 5-1 in game two, it looked like the Bruins had it in the bag. But Montreal came back to win that game 7-5 to tie the series, then won game three to take the lead. Although they were blown out in game four and five, Montreal bounced back to win game six and seven thanks to Dryden’s solid play. 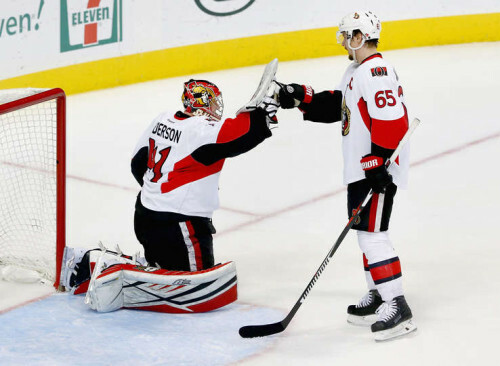 He averaged 41 saves every 60 minutes, including 49 in the game five 7-3 loss. The number of saves he made frustrated the Bruins and ended one of their best seasons ever with a first round defeat. 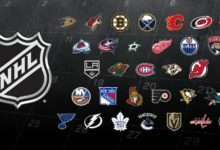 This video below from NHL.com looks back at Dryden’s incredible post-season run. Boston was the first road block for the Habs on the way to their 17th Stanley Cup. Dryden won the Conn Smythe that year and emerged as a Hall of Fame goaltender for the Canadiens. 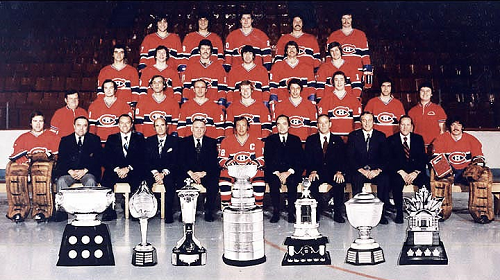 After beating Don Cherry’s Bruins for the Cup in 1978 and winning three in a row, the Canadiens would knock Boston out in seven on their way to another Cup in 1979. This was another series that went the distance and ended in the most spectacular way possible. Montreal would get a goal from Yvon Lambert to win it in overtime. 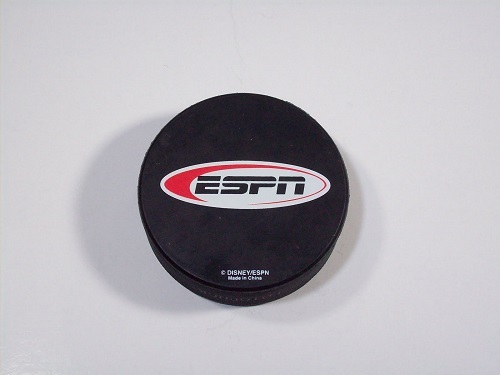 They would then advance to face the New York Rangers and beat them in five for their fourth straight Stanley Cup. It is moments like these that make the rivalry between Montreal and Boston unlike any other in sport. These teams have played in many memorable series since Montreal first beat Boston in the 1930 final.